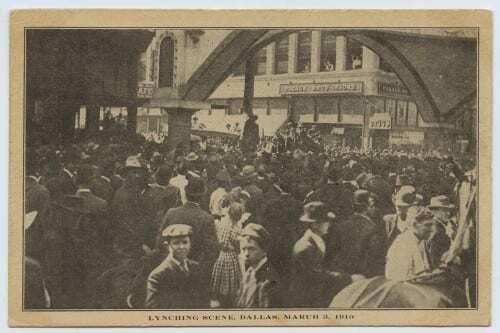 Print souvenir postcard from Allen Brooks lynching, March 3, 1910.Cook Dallas/Texas Image Collection, DeGolyer Library, SMU. A high-quality version of this file may be obtained for a fee by contacting degolyer@smu.edu. From “Set of 4 Brooks Lynching pcs–“All Three Varieties in Set.” Includes, 1 RPPC, 1 street scene 2 hrs later, 2 printed pcs of hanging.” Accession number A2014.0020, Cook Col., RPPC Dallas (old Box H #30). Courtesy of Southern Methodist University, Central University Libraries, DeGolyer Library. A high-quality version of this file may be obtained for a fee by contacting degolyer@smu.edu.